A boomerang is a flying tool with a curved shape used as a weapon or for sport. Although it is usually thought of as a wooden device, modern boomerangs used for sport are often made from carbon fibre-reinforced plastics or other high-tech materials. Historically, boomerang-like devices have also been made from bones. Boomerangs come in many shapes and sizes depending on their geographic or tribal origins and intended function. The most recognizable type is the returning boomerang, which is a throwing stick that travels in an elliptical path and returns to its point of origin when thrown correctly. A returning boomerang has uneven arms or wings, so that the spinning is lopsided to curve the path. 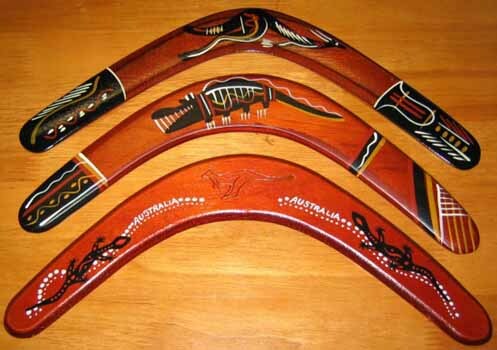 Although non-returning boomerangs throw sticks (or kylies) were used as weapons, returning boomerangs have been used primarily for leisure or recreation. Returning boomerangs were also used as decoy birds of prey, thrown above long grass in order to frighten game birds into flight and into waiting nets. Modern returning boomerangs can be of various shapes or sizes as can be seen in the diagram of modern Boomerangs to the right of page. Historical evidence also points to the use of non-returning boomerangs by the ancient Egyptians, Native Americans of California and Arizona, and inhabitants of southern India for killing birds and rabbits. Some boomerangs were not thrown at all, but were used in hand to hand combat by Indigenous Australians. Boomerangs can be variously used as hunting weapons, percussive musical instruments, battle clubs, fire-starters, decoys for hunting waterfowl, and as recreational play toys. The smallest boomerang may be less than 10 centimetres (4 in) from tip to tip, and the largest over 180 centimetres (6 ft) in length. Tribal boomerangs may be inscribed and/or painted with designs meaningful to their makers. Most boomerangs seen today are of the tourist or competition sort, and are almost invariably of the returning type. The use of the throwing wood is verified by rock paintings dating from the Neolithic Age (since approx. 5000 v.Chr.). Finds from this time are not really suitable as unique proofs, because wooden pieces of equipment are only hard to preserve through thousands of years. The throwing wood was mainly a hunting weapon (long-range weapon, flying weapon) to hunt hares, birds and other small animals. Its use as a battle weapon played a minor role. Its character as a battle weapon was lost as soon as the culture reached a higher stage of development. The throwing wood developed separately in different places of the planet. There are returning boomerangs and non-returning boomerangs. Non- returning boomerangs were used for hunting. Hunting boomerangs, called Kylies, are about three feet long and have a chord width of three to four inches across, being about one half inch thick and similar in shape to a banana. When thrown they fly straight and do not return to the thrower. A throw stick can fly great distances. One hundred to one hundred fifty-yard flights are not uncommon. Throwsticks have been found in many countries such as Egypt, Africa, Poland, Holland, United States and of course Australia, just to name a few. How did the kylie come into existence? The best thinking is that prior to throwing sticks people used clubs to settle their differences. They'd use them like a battle-axe and even throw them at their opponent when they ran away. Perhaps it was discovered that a curved club flew further when thrown than a straight one did. They then realized that a thin club flew further than a thick one. At this point the basic concept of a throwing stick was established and used. In Australia it became engrained into the culture and was handed down from generation to generation. How old are Kylies? The oldest known kylie found carbon dated back to 20,000 years old and was made from Mammoth tusk! By the way it was found in Poland. Hopi Indians in the Southwest United States used kylies, though they called them rabbit sticks. No matter what you call them the Kylie, throwstick or Rabbit stick was a well-suited weapon for hunting in open country. Imagine a three-foot wide stick spinning around its center of rotation as it traveled through the air. Since you aim the kylie at what you are throwing at it has an advantages over a spear. With a spear if you want to hit something off in the distance you have to throw the spear up, which gives it a curved flight. This is because a spear does not generate lift as it travels through the air. Kylies do and so can stay "afloat" at it travels. So where did boomerangs come into the picture? Truthfully no one can answer the question with surety. Based upon what has been found, it is common belief returning boomerangs originated in Australia. That really doesn't surprise you does it? How do we know that? Primarily from the abundance of boomerangs found there and the lack of returning boomerangs anywhere else in the world. There are a few examples found in other regions that many return, but that is still questionable. How was the returning boomerang developed? Once again, we really don't know for fact. See if this makes since to you. One day an Aboriginal person was shaping a smaller, lighter slightly more bend throwstick than he normally used. When he tested his small throwstick he was very surprised to observe that it didn't fly straight at all but rather it started returning back to him. Viola the birth of first returning boomerang! Created by chance or skill? No one really knows. What we do know is they made it and passed the technique down through generations of time and we have it today, thankfully. What were boomerangs used for? Life is no fun without playtime. Wouldn't you agree? Returning boomerangs were used as toys and for sport. Of course the Aborigines used what few tools they had for all manner of tasks. They would use Kylies and boomerangs to dig up roots to eat. They would use them as cooking tools. They would also use them to rub or clack together to make music. They also used them as clubs and for throwing. Modern day: Sport enthusiasts in many countries of the world use boomerangs today. The pure joy and pleasure of throwing a boomerang is unmatched to other sports, in my opinion. Boomerangs are also used in competitions. Yes Boomerang Competitions. Some of the events include Long Distance, Fast Catch, Endurance, Trick Catch, Doubling and Accuracy and Aussie round. Boomerangs today are fashioned in hundreds of different shapes. Some have three or more wings! A boomerang can be crafted to fill a certain niche or have specific flight characteristic. Airfoils can be modified to increase lift or decrease lift. Drag can be added to the design to slow the boomerang down on its return. Even the material itself can be changed. Don't think of boomerangs being made from wood only. Today boomerangs can be made from high-grade plywood, exotic woods, and plastics of all sorts, resin impregnated paper, linen and fiberglass cloth. Even space age materials like kevlar and carbon fiber are used by some manufactures. Lenoch assumes in his thesis that an object of examination (such as the throwing wood and boomerang) is determined by function, shape and material. The genesis of the throwing wood and the boomerang is therefore directly linked with the prevailing environmental conditions and the stage of development of the corresponding people. Lenoch describes the throwing wood as follows: The throwing wood is a crooked piece of wood, which is able to fly with or without having a grip. Generally it is thrown and then rotates in the air, but occasionally it also can be used as a club. Unlike the throwing club, the throwing wood does not concentrate on the effect of hitting. Only the variant which returns to the thrower is called a boomerang. With his description of the object, Lenoch distinguishes the term of "throwing wood" from other terms like "throwing club" or "throwing stick". With the throwing club the effect of hitting is mostly concentrated at the distal end, while the throwing stick is a straight rod of hard wood that rotates while flying. The throwing stick is mostly sharpened at both ends and hits top first. A boomerang can be understood as the variant of the throwing wood which is used for playing and sports and with which a return throw can be made. The origin of the name remains unsolved, though Lenoch tries some etymological approaches. In the second chapter dealing with Europe Lenoch already comes to a conclusive result, in our opinion, in which he determines the localities where the historical origins of the boomerang must be located. For this reason, we went beyond Lenoch's description here and have investigated his source texts to analyze the evidential value of his core statement. Afterwards we will describe his geographical outline. The invention of the boomerang is commonly ascribed to the Australians, however, according to Lenoch, it is probable to have been invented in India and the ancient Orient; and for ancient Europe it is even proved. Lenoch refers to two historical texts, mainly to the one by Isodorus Hispalensis, the bishop of Sevilla of that time. He wrote in the 7th century in his Origines. The terms in brackets refer to differing passages from the original text of Isodori. A possible translation of the text-here by Beate Rodenberg- is: It was called the clava (stick) - of the same composition like the one Hercules had- because it was fixed with two iron clubs on either side; it has a length of half a cubit. This is the cateia (throwing club), which was called caia (club, cudgel) by Horaz. There is a kind of a Gallic missile consisting of very flexible (inert) material, which does not fly very long, when it is thrown because of its heavy weight, but arrives there nevertheless. It only can be broken with a lot of power. But if it is thrown by a master (its builder), it returns to the one who threw it. Vergil reminds us with the following words: " One used to fling throwing clubs similar to the habit of the Teutons". Since then both the Spanish and the Germanics call those "teutonas. In the Cretan-Minoic Region (ca. 2000 BC): Sign of rank and dignity of military leaders. In Greece commonly used weapon with the term "lagobolon" hare club, hare thrower. The throwing wood is not proved to have been used by the Romans (from approx. 500 BC), only for the rural populations hunt of hares. The Cateia seems to have been a crooked weapon with the characteristic ability of returning -ergo a boomerang- which was used by the Gauls and the Teutons (From approx. 100 AD). For the North, the use of the boomerang is proved for the bird hunt, approximately at the times of the Goths (from approx. 100 AD). Poland: Surely the oldest find from the: "Olazowa Cave" in the "Polish Carpathians"
Germany: boomerang find in the: Elbschottern near Magdeburg (approx. 800 - 400 BC). The origin of the throwing wood remains unsolved. That it was introduced by cultures outside Europe is unlikely, but an influence from the ancient Orient (Near East) is probable. In North Africa, the constant use of the throwing wood can be proved from the Neolithic Age (from approx. 6000 BC) up to the recent past. It is likely to have been spreading from the North-East to the North-West up to the Atlantic Ocean (Sudan, Cameroon, Guinea, Niger, Morocco, Canary Isles). Towards the South, no exact boundaries can be found. The African center of the idea of the throwing wood was located in the Sudan. The throwing wood was a characteristic element of the old culture of the steppe hunters. After the introduction of iron (approx. 600 BC) it developed into the throwing knife. In Morocco, it was used as a toy and a piece of jewelry with lots of ornaments. Though it was used as a battle weapon (throwing and hitting weapon), the real application of the throwing wood was hunting. Especially the noble Egyptians used it for the bird hunt (social value of the throwing wood). Hardly proved to had been a sign of rank and dignity or as a weapon of the gods or for battle. Throwing woods of ivory with a ritual character (finds from the grave of Tut-anch-Amun, approx. 1340 BC). Many various types of throwing woods were developed until the end of the time of the Pharaohs. The existence of boomerangs is not really proved, though the possibility of the flight in curves can hardly have gone unnoticed in Egypt because of the large number of possible variants of throwing woods. In the Near East, advanced civilizations (from approx. 3000 BC) used throwing woods as royal badges, signs of dignity of gods and kings and as symbols. The shape of the throwing woods did not seem to be suitable for practical use. They can be found in the cuneiform script as picture symbols. Most proofs were found within the Assyrian and Babylonian regions. Further development of the throwing wood into the scimitar. Its land of origin is Babylon. Later it was transferred to Egypt and Greece; most recent past: the oriental scimitar. According to Winckler the idea of the throwing wood came from the advanced civilizations of the Near East and spread in Europe, Africa, India and even in Australia; Bork maintains that the Australian boomerang was derived from the Babylonian weapon of the gods. In the region of India, the throwing woods are not very popular. They are used in two regions of the Near East till today (1949). 1. The North Indian throwing wood; the primitive throwing woods were only used for hunting and made of wood. 2. The South Indian throwing wood, which was used as a battle weapon before India became a British colony. By now, the boomerang has lost its use as a weapon and has become a cult object. Parallel to the functional change the material was changed from wood to iron and ivory. The question as to whether the South Indian throwing woods were returners, i. e. boomerangs, is seen as controversial. More recent examinations deny it, although the returning throw is not unknown to the Indian mythology. Indras Thunderbolt, for example, returned into the hands of the god after he had thrown it. In the region of America, throwing woods were highly important as hunting weapons. The throwing wood was used for the first time approx. in 100 AC and was used for the rabbit and duck hunt. The building material was wood. There is a striking concentration of the use of throwing woods in the Southwestern part of Northern America. After a detour to the Southeast, the throwing wood made its way to the East to todays Canada. There it mainly served as a battle weapon, which caused the throwing wood to alter its shape and be shaped more and more like a hatchet. On its way to the South, it reached Mexico, where it was mainly used to hunt hares. Additionally, the throwing wood was treated as a weapon of the gods. The throwing wood can be found sporadically on the southern continent as well. And in today's Brazil sorcerers are said to have known boomerangs. On South Celebes, throwing woods were used to drive birds out of the rice fields. On Central Celebes, Java and Sumatra and also in Queensland, a cross-like throwing wood, made of bamboo splinters, serves as a toy for children. It has a boomerang-like flight line and became known as a "cross Boomerang", though it generally "does not have anything in common with the boomerang", according to Lenoch. Besides the throwing woods made of wood, which show a bow-like flight line, the inhabitants of the New Hebrides use also stone weapons shaped like throwing woods. Australia is today's main country of the throwing wood, although the throwing wood cannot be found in all the regions of Australia. The throwing wood does not exist e.g. in the extreme north and in Tasmania. In addition, the throwing wood is not used as a battle weapon in the other regions. The thinnest and lightest throwing wood can be found in Western Australia, where it is used mostly for fish hunting. In Southern Australia, the throwing wood is also used to hunt fish, but it is much heavier there. 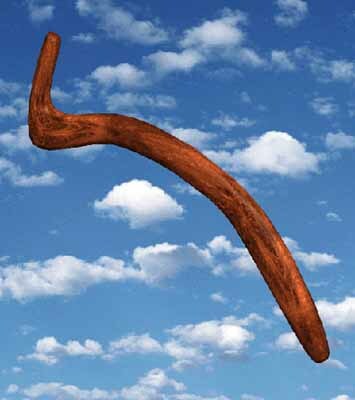 The existence of the real boomerang is restricted to the East and the South and also to Southern Australia. It is not nearly as popular as the throwing wood and is always found in the company of the throwing wood. In its shape, the boomerang differs slightly from the throwing wood and even natives need to throw it to make a distinction.